Blending raw, rhythmic desert sounds with driving 60s acid rock, The Green Door beckons the listener into a landscape evocative of the wild, uncompromising West themes of the 1960s with a mind-bending, psychedelic twist. 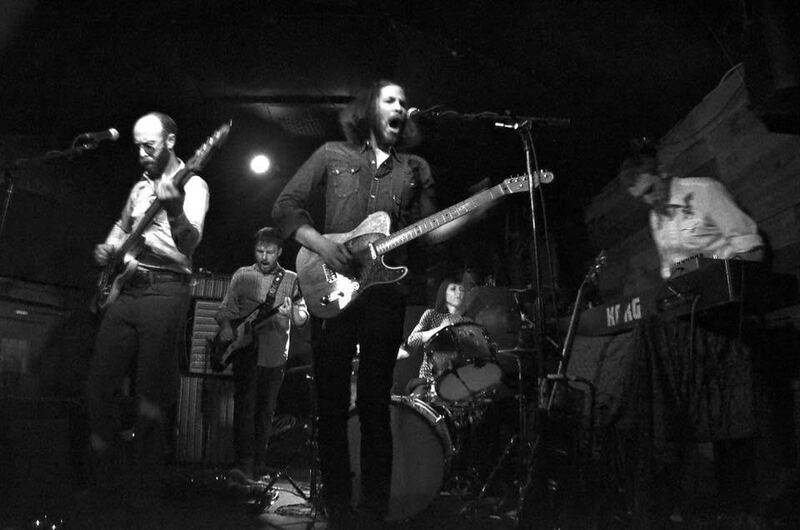 Formed in San Francisco in 2008, the band is comprised of Mike Carnahan on lead vocals and guitar, Reese Abell on bass, guitarist Evan Wardell, and drummer Vanessa Wolter, as well as Devin Triplett on keys. The Green Door'satmospheric strumming juxtaposed with formidable signature riffs that coast atop pounding, driving beats send the listener's mind spinning off to the badlands beyond the border of sonic civilization. The result is a melodic reckoning force of American myth and counter culture ideology. Deriving their name from a Bob Dylan comment in the 1967 documentary "Don’t Look Back", the concept of a green door stands as an image of mystery enclosing the individual’s perception of the outside world. The Green Door takes reference from throw-back genres and low-fi records as well as American western iconography and legends, but looks forward in its artistic song writing approach, as is evident on their first full-length album titled The Green Door released in 2011. In this way their music has an avant-garde aesthetic, yet still feels familiar. The Green Door will be releasing their second album in Spring 2016.